Met de Walkin' Front wielen en bevestigingen kan de hondenrolstoel van Walkin' Wheels omgebouwd worden tot een QUAD rolstoel (4-wielen) met volledige ondersteuning voor de voorste en de achterste ledematen van uw viervoeter. Geschikt voor honden van 5 tot 12 kg. 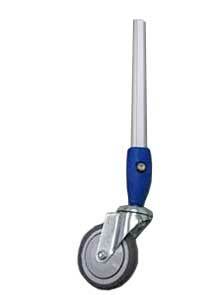 De Walkin' Front wielen ondersteunen uw viervoeter volledig de voorste en achterste ledematen in de Walkin' Wheels Small Hondenrolstoel. 1: Meet uw viervoeter de Fold of Flank (FoF) op. 2. 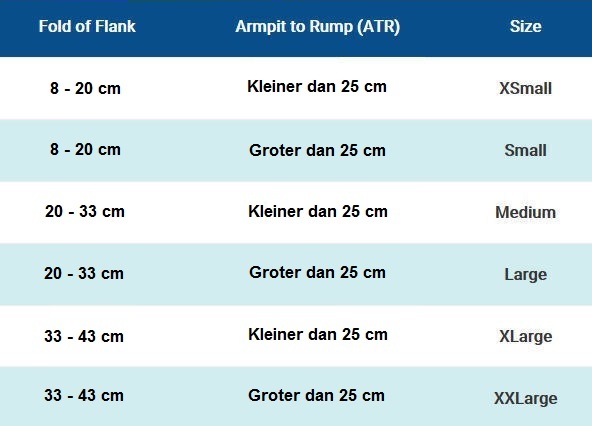 Meet uw viervoeter de Armpit to Rump (ATR) op. Wat is de inhoud van de doos? A: Left and Right Extenders (2). These replace the extenders that originally came with your Walkin’ Wheels Rear wheelchair. The extenders will have a white label with “left front” or “right front.” Socket shoulder screws (4) should be on the outside of the wheelchair and are used to attach the leg rings. 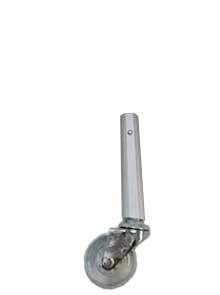 Silver struts (attached to C1 or C2) fit inside the wheelchair legs. 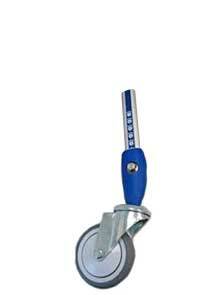 The height can be adjusted by a push button on each strut. C1: Struts and 3” wheels (2). The caster adapters will be marked with a raised “L” or “R” to indicate which side they are installed on. This is VERY important. The raised L or R should face the inside of the wheelchair with you standing behind the wheelchair. C2: Struts and 2” wheels (2). Struts come attached to 2” wheels for shorter dogs like Dachshunds. These are labeled “L” or “R” to indicate which side they are installed on. D: Front Leg Rings (1). You will not need to use the front harness that comes with the rear wheelchair. You will install the front leg rings instead, just like the rear leg rings. Leg rings should look like two Cs and not two Vs. The straps go over the frame; pull the black plastic clip over the socket shoulder screw and push upward. You will hear a click when it is locked into place. 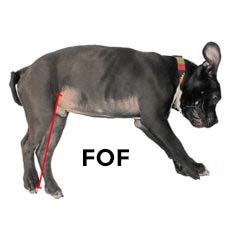 The dog’s front legs will go inside each ring to support his/her body in the front. To remove the leg rings, put your thumb on the circle and pull down. E: Bag of screws (1). Only for replacements, if needed.